Before Buster came to invade my territory visit, my grandpawrents took him to be groomed. My mom person noticed something that she’s never seen before. 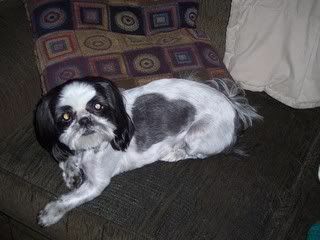 Buster has a heart marking! In all 12 of his years we’ve never noticed it. Maybe he’s not so bad after all. As long as he stays out of my nest & my food! I hope that he does stay out of your nest and food. He does look cute, but he shouldn't bother your areas. Thanks for pointing it out…Hope he stays out of your stuff!! Oh my God, that is SO cool!! You know my human read in some countries (like China) some crazy people pay a LOT Of money for dogs with special markings!! Maybe it just took 12 years for Buster to finally express his true love? I think you should embrace it, especially since he's so clean and all! How cute!! Almost as good as the cow adopted by Disney that has a Mickey mouse marking on her side. So I smell publicity?? That is kind of cool, but still he better not mess with my Oskar. p.s. but really that is cool. That is very definitely a HEART! ohmigod, it's cute, a beautiful heart, no doubt about it! that's amazing! and the title is so funny!